The Naturalest Naturalist: Where my peeps at? The answer is Esquimalt Lagoon! I made a run out to Esquimalt Lagoon after work today in hopes of catching up with the Franklin's Gull that was seen off and on last week. It hadn't been reported for a couple days and a similar-looking bird turned up at Clover Point yesterday, so I wasn't too hopeful. As I rolled along, I saw a birder set up with a scope and thought I would hop out and see if they had found anything of interest. The birder introduced herself as Monica and I said I was Jeremy. Just using my first name puts birders that haven't met me in a tricky position if they follow the birding groups. Am I Jeremy Kimm, Jeremy Tatum, Jeremiah Kennedy, or Jeremy Gatten? She guessed Gatten and I guessed Nugent and we were both right. Monica was over to look for a few species that are a little trickier to find over on the Lower Mainland, including Black Turnstones, Rhinoceros Auklets, and Heermann's Gull. She had knocked off her targets and was just exploring some of the local hot spots. When I asked if she had anything interesting at the lagoon, she said she had a group of sandpipers. I scanned out with my binoculars and could see a handful of Leasts and a Western. Looking further along the shoreline, I could see a couple other peeps. One appeared to be a Western Sandpiper resting and the other appeared to be larger and quite uniform in colour on the back. I had an inkling it was a juvenile Baird's Sandpiper and a look through Monica's scope confirmed my suspicion. I walked along the beach to get a closer look and to try to snap off a few shots of the Baird's. I didn't want to flush it, but I wanted to get right at the water's edge to get the light as close to being at my back as possible. The peeps were all relatively close together and I gave them a decent amount of room, so my shots actually provide a nice comparison of the three species. If I was better at capturing a broad depth of field, it would have been a really good comparison. Instead, the shots have the Baird's as the primary focus and Leasts and Westerns are slightly out-of-focus. These are always the most instructive situations - multiple species side-by-side for a perfect comparison! In the above photo, the leftmost bird appears to be the largest and this is the juvenile Baird's Sandpiper. Baird's are slightly bulkier than both Least and Western Sandpipers, averaging an inch longer and weighing approximately one-third more. In addition to their size, juvenile Baird's can be distinguished by their brown-buff upperparts, scalloped appearance to the back created by pale-edged feathers, long primary projection and ever-so-slightly decurved bill that tapers to a fine point. It is also worth noting that the bill and legs of Baird's Sandpipers are black. The front bird and one behind it are Western Sandpipers. The overall impression of a Westerns is a greyish-backed bird with rufous upper scapulars, a relatively long, drooping black bill, and black legs. Westerns average around half an inch longer and one-fifth heavier than Least Sandpipers and one of the first steps most take to separate them is to look at their legs and bill. In addition to the front two, the first and last bird of the rightmost group of four at the back are also Westerns. Least Sandpipers have yellow legs and a shorter, slightly more strongly decurved, finer-tipped bill. Adult Leasts are drab brown on their upperparts, while juveniles have dark-centred back feathers that are rufous-edged. 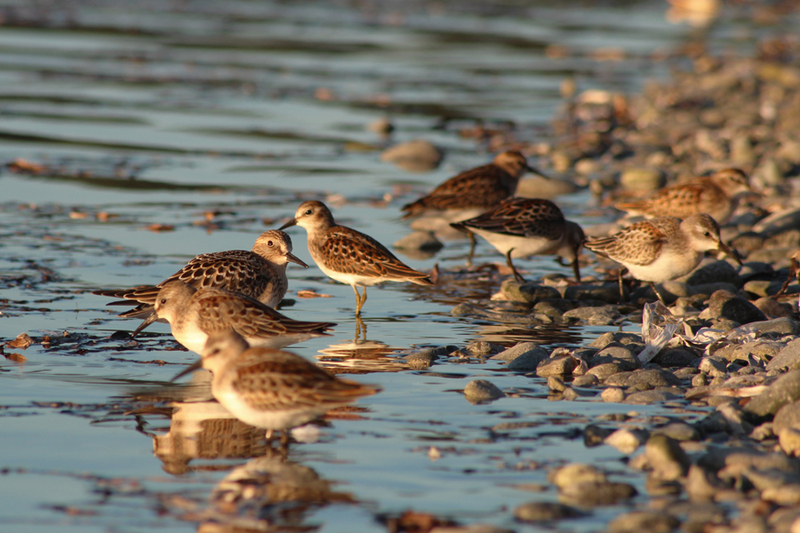 The bird that has the Baird's Sandpiper's bill crossing it, also partially obscured by a Western, is a Least. Even harder to tell is the centre two birds in the righmostt group of four at the back, which are also Leasts. Nothing beats experience in the field with multiple species in close proximity. The photo does not do the best job of showing the differences but you hopefully get the idea. I added one more shot to show the Least Sandpiper a little better. Based on my description above, you can see the Least is a juvenile. Typically the majority of the adults move through first and then juveniles, so most of the birds in the late summer are juveniles. The other feature this shot shows off nicely is the long primary projection of the juvenile Baird's - note how the primary tips project past the tail. That's one of the classic field marks for the species. Now is a good time to get out for peep diversity, with Least, Western, Pectoral, and Baird's as the likely species to be encountered. 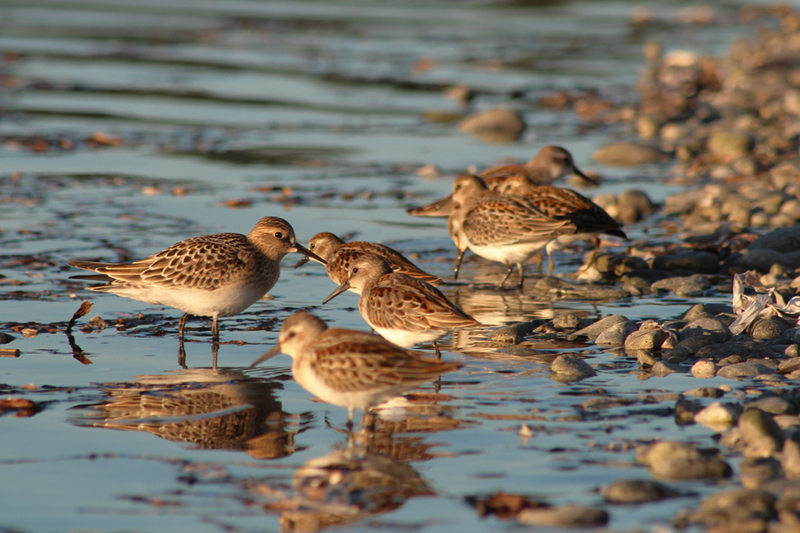 Get out and see what you can find at your local shorebird hot spot!